Laurel and Hardy fans have had the rug pulled out from under them so many times when it comes to the discovery of this film that it seems impossible that it will ever turn up. But let me be the first to say that I will almost guarantee that Hats Off will be found in my lifetime (I can’t speak for yours). 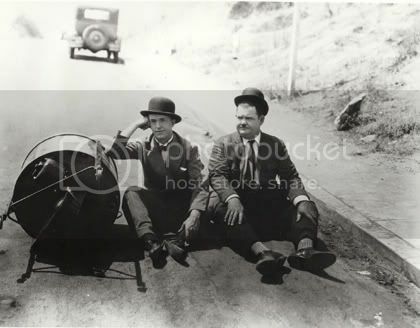 Just look at Laurel and Hardy history and see that the odds are stacked in our favor. We had our list of 105, but there were five ‘missing films’: Duck Soup, Why Girls Love Sailors, Hats Off, The Battle of the Century, and The Rogue Song. In 1974, Duck Soup was the first of these to miraculously re-surface. It was found in the format of a French 9.5mm home movie edition. Subsequently, a Belgian 35mm reissue provided us with a beautiful print to enjoy. Currently the only missing element from Duck Soup is the original English title cards. 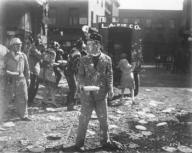 The pie-fight sequence from The Battle of the Century, although incomplete and re-edited, was saved by Robert Youngson when he prepared his 1958 compilation The Golden Age of Comedy. The negative that he used was already in an advanced state of decomposition and only this portion was salvaged by Youngson. In 1979, we got to taste another missing piece of the Laurel and Hardy pie with the discovery of the opening boxing match scene. Even with this surviving footage, less than half of the complete film is known to exist. It was not until 1985 that the major discovery of a French 16mm print of Why Girls Love Sailors took place. Unfortunately, the quality was poor, appearing extremely grainy and murky. But as Stan said “Any bird can build a nest, but it isn’t everyone that can lay an egg.” In 2000, an original European 35mm nitrate camera negative was located bringing viewers the opportunity to see this once-lost treasure in glorious pristine format. The Rogue Song has remained one of the most intriguing and frustrating of the lost films, mainly because it is one of the very few examples of the boys in color. Although their footage amounts to less than twenty minutes of the nearly two-hour film, it has been placed on the American Film Institute’s top ten most wanted films list. And piece by piece, The Rogue Song continues to come together. The complete audio soundtrack, one three-minute clip with Stan and Babe, the complete theatrical trailer, one reel of assorted scenes, and a half-reel of a ballet sequence have all been located. Another recent discovery indicates that two Laurel and Hardy scenes from The Rogue Song (the shaving scene and the bee-swallowing scene) were televised as recently as 1970. In 1989, the unthinkable occurred: the second reel of a ‘new’ film did ‘pop up’ which included both Stan Laurel and Oliver Hardy. It was the 1927 silent Charley Chase vehicle Now I’ll Tell One, making every known filmography of those famous 105 films now obsolete. One may also wish to add to this filmography the seven Spanish language films that were discovered in the back of an M-G-M vault in 1986: Ladrones, La Vida Nocturna, Tiembla y Titubea, Noche de Duendes, De Bote en Bote, Los Calaveras, and Politquerias, all of which feature Laurel and Hardy phonetically speaking their lines of dialogue in Spanish as well as many additional scenes edited from the American release prints. So what about Hats Off? Nothing. Nada. Zip. Zero. Zilch. Bupkis. All we have are rumors and reports. Which brings us back to the claim from 2002 mentioned at the beginning of this article… This fellow claimed to be Elmer Guiol, nephew of Hal Roach director Fred L. Guiol. 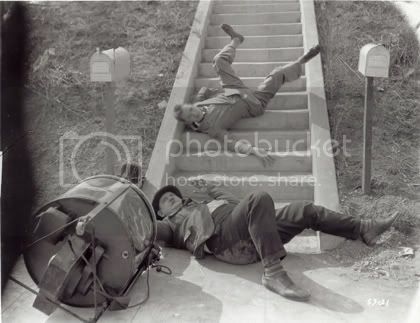 He stated that his uncle held many cans of unprocessed ‘movie copies to films made by the Hal Roach Studios.’ Among them were two versions of the opening spool of the film with the boys attempting to climb a staircase carrying a washing machine. He goes on to claim theat the picture quality is excellent due to the nature of the films spools, which were unprocessed until recently. Elmer stated that he understood that this film was not available to the public at present and that, having access to these reels of film, he was currently in negotiation with various video companies with regard to its possible future release. Incredible? Absolutely. Unbeleiveable? You tell me. But in case it is true, I wanted to report it first. If it’s another rib, I never really believed it any way. After all, Fred L. Guiol didn’t even direct Hats Off. But then why would old Elmer impersonate his nephew? If Laurel and Hardy history teaches us anything, it is that nothing is too far-fetched not to be the truth. Or something like that. Perhaps the boys are orchestrating their newest playlet from their seats in heaven, the sequel to Leave ‘Em Laughing, entitled Keep ‘Em Guessing. Just bear this in mind the next time you poo-poo the idea of Hats Off being discovered: the Dead Sea Scrolls were hidden around 67 A.D. and not located until 1947! Okay, so maybe we won’t have Hats Off in my lifetime. But never say never! 9 Responses to Will We Ever Find “Hats Off”? There was a Hats Off “sighting” in the mid-1950s. An early TV film distributor named Lake (I have a Xerox of his catalog) listed Hats Off as available for TV bookings. He had a few hundred Roach and Sennett titles in his catalog, mostly Pathes but a few MGMs. Now many of the other silents on his list are now considered to be lost films, which raises the possibility that Lake had lots of Pathes, but rather than actually catalog them, he copied titles from old release charts under the assumption that he probably had the prints. There were a few lost Charley Chases on his list too. The surest way to guarantee a film’s survival is for it to have been syndicated to television. And the fact that there aren’t a gazillion 16mm prints of Hats Off floating around suggests that Lake never did own this title. We have almost the entire run of late silent Felix the Cat cartoons thanks to early TV. Wow. My first glimpse of this site (and a great one ’tis) and already posting my second comment. Mr. Guiol’s reference to unprocessed film seems suspicious. You only process the negative. Then the custom was to make an inter-negative from which all positive release prints were struck. It is true that Roach made two orginal negatives (U.S. and foreign), but is Guiol claiming neither one had ever been sent to the lab to be developed? If so, the film would never have been released. And there are only two video companies that Guiol could possibly be negotiating with: Turner and Richard Feiner, the only claimants to the rights to the silent MGM L&H’s. And Turner was sued by Feiner, forcing Turner to stop showing and sellling L&H’s Laughing Twenties on VHS and laserdisc. Finally, his terminology is off. Most people use the word “prints” instead of “movie copies”. And “spools”? Film is stored on “reels” or “cores”. As to Guiol’s identity, no doubt he is who he says he is, but I once received an e-mail from someone claiming to be the reincarnation of Noah Young. Well, anything is possible. I guess. A reincarnation of Noah Young?? Yikes, I bet he was attractive! One L&H bio reports that a movie buff actually saw a print of Hats Off in the 1950’s, but when he went back the next day to purchase the print, it had become inexplicably lost. Maybe that one’s an “urban legend” as well. 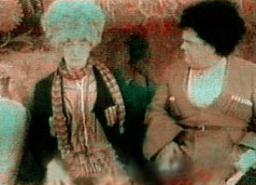 I’m constantly amazed at the “new” Laurel & Hardy material that pops up. My favourite of recent years was the radio show “Mr Slater’s Poultry Market”. To me it was like discovering a completely lost, unknown 2-reeler…with the benefit of experiencing Mr Laurel & Mr Hardy in a medium they seldom visited, and hearing them in front of a live audience. BUT, what really caught my eye in this article was…where did the frame grab from ROGUE SONG come from? Hey, this is a great article, and I appreciate you writing it and putting it here. This is a great website- I just registered, and I’ll be sure to come back here often. I think that an important thing to remember in looking for Hats Off is that if it exists, it most likely is in a mislabelled can, or it’s a print given another title altogether. If you call up a film archive and ask, “excuse me, do you have a copy of Hats Off?”, they’re going to type that name in their computer list and say, “no such title in our collection”. If Hats Off existed under the title of Hats Off, someone would have noticed this by now (unless if it’s buried in some vast archive behind what was known as the “iron curtain”) . What anyone with access to old films has to do is to look at practically EVERYTHING, because it could be mistakenly stored in film cans labelled for something else, like newreels or whatever. It might even be mistakenly labelled “The Music Box”, because of its scenes on that staircase. Hopefully, the film is out there somewhere. It’s encouraging that so many films that were lost have been found, like Duck Soup and Why Girls Love Sailors. It’s good that they’ve found long-lost foreign language versions of L+H films, since those films have slight differences and added bits of business. I read somewhere that Tree In a Test Tube wasn’t even known to have existed in the first place- that it was sporadically shown without fanfare, and then forgotten, so that no one knew about it at all. Then someone was cataloging some huge collection of WWII government films, in 1973, and came across this previously unknown title without even expecting to find any such thing. Hopefully, someone with access to old films will come across Hats Off. There should be a post all over America- search your attics for our lost film Hats Off! Lets hope this has not happened to our lost Hats Off and The Rogue Song. I love your article about Hats Off and the other apparently lost L&H films.’I have two stills from Hats Off which are not easily seen anywhere, and would like to share them on this wonderful site (see below). You mention five missing films. Make that six: Even Lucky Dog was once considered a lost film. As I understand it, Robert Youngson found it when he needed it for one of his compilation movies. It was me, by the way, who helped to bring the French 16mm print of Why Girls Love Sailors to light, what an experience that was!! You just ask a french collector about the missing L&H films, and immediately you are offered a vhs copy of Why Girls Love Sailors! I have since then located and identified the trailer for the German version of Pardon Us. she followed her husband to Canada. And one child, Peggy.